I have a weird habit when it comes to breakfast. I pick one thing and then I eat it everyday for years. My last obsession was hard boiled egg on english muffin and that lasted over 3 years. Before that it was bagels and that was an over 10 year obsession. Right now I am on a breakfast sandwich kick. Who knows how it started. Hubby says I am highly suggestible, so I probably saw one on TV and am now eating it every day. I like to add spices in my eggs, right now I am going with a mexican spicy egg. Sometimes I make them with Italian seasonings. It is an easy, hot, tasty breakfast and it really gets my day going. Heat small frying pan on medium heat and spray pan with cooking spray. Start toast and set to your desired level of toasty. Beat egg with a dash of water and a sprinkle of salt, pepper, Mexican oregano and chipotle powder. Cook egg and while cooking try to keep the egg as one mass and work it into a patty shape that will fit on your english muffin. When the toast is done, sprinkle on the cheddar cheese and park it back in the toaster oven to melt the cheese slightly. Place the egg in the english muffin and enjoy! i might have to spice it up! breakfast of champions! 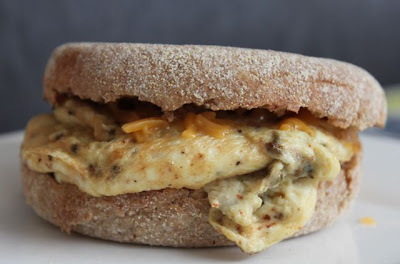 I just bought a giant package of sprouted grain english muffins to make egg sammies with! though I forgot to buy eggs! drat! Holy Cow - this looks incredible. Want to come to my house and make me breakfast? ?